Having recently returned to the real world after attending SMACCDUB in Dublin, we thought we should try to articulate some of the things we learnt. Rich: Having only lost my SMACC virginity last year, I had little by way of comparison other that what had been a monumental learning experience. SMACC Dublin felt and was different. Not just because it was in a less sunny and aesthetically pleasing city (sorry Dublin, you’re still awesome), and not because it was any less of a learning experience, it was just different. It felt as though there was an air of high emotion and this was a theme that reoccurred throughout the conference. The opening ceremony included an incredibly moving and poignant tribute to John Hinds and the presentations in the ‘John Hinds plenary’ from Scott Weingart, Victoria Brazil and Gareth Davies were fitting. We are used to no-nonsense, cut the BS talks from Scott, however this presentation took on a deep and reflective tone and was a persuasive argument to reflect, meditate, look after your own mental health and to recognise and value the impact of others on your own life. You can have a taster of Scott’s talk here. The final presentation of the plenary was a powerful and raw reflection on the life and work of John Hinds by Janet Acheson and Fred MacSorley. It was a reminder of how much could be achieved by one person at such a young age. There were a number of moving and reflective presentations throughout the conference; a stand out for me was the moving personal account of the Boston marathon bombings from Christina Hernon. Chris: I meanwhile, was a complete SMACC virgin. Rich (and several others) had droned on about how fun Chicago was last year, so most of my year was spent ensuring that I would have leave to attend. It was everything I expected and more; a fantastic time. In the opening plenary, Vic Brazil gave a masterclass in presentation, drawing the audience in on the tale of how she knew when she had become a resuscitationist. At one point Vic even managed to have a conversation with herself without the audience thinking she’d gone crazy. It’s definitely a talk to watch out for when they get released online. Rich: Being a bit of an aspiring physiology nerd, I felt the need to be schooled and went to the critical care concurrent looking at oxygen and stress. The take home message was pretty much not to give oxygen, or at least have a real good hard think about why you are. John Myburgh and Steve Bernard delivered first class lessons in oxygen physiology. It appears that we are heading towards a similar view towards oxygen as we have about fluids; too much can be, or is harmful. Chris: Meanwhile, I wanted to find out how other people practise medicine, and saw Casey Parker speak on emergency diagnostics with a smattering of Bayesian theory and Fagan nomograms to help make sense of probability in diagnosis. The key message was to think about the patients, they carry the risk of everything we do, and they are the ones that we are treating. Don’t forget it can be harmful to overinvestigate! Steve McGloughlin made some very interesting points about the diagnosis of sepsis, in particular our very broad definition of what it is. We don’t just have one definition for all types of cancer, why do we just have one for all types of sepsis? Journals may be dead! We both attended an epic debate between the editors of the BMJ and the NEJM (with some input from 2000 social media fans!). The gauntlet was well and truly thrown down. Should journals be abolished? What constitutes peer review? The future outcome of this debate will be interesting to see. An interesting post-SMACC blog has already been written by past BMJ editor Richard Smith here. The Dunning-Kruger effect made a significant appearance…and if you have not heard about it yet, read here. Compulsory immobilisation is probably a dated approach. We should be aiming to remove them in 2 hours. If they need to be on for longer than 2 hours, swap them for a Miami J or Philadelphia collar. If hard collars are such a problem, then you probably have a wider problem with your trauma system. Chris: There was also a similar style of debate in the main auditorium on matters of Emergency Medicine. One such fight was on whether ultrasound was useful. Sadly for the person arguing against, they were trying to convert the choir! Our very own Iain Beardsell took on Anand Swaminathan to determine if we should thrombolyse submassive pulmonary embolism. Starting off the talk as a bumbling Oxfordian professor, he quickly dropped the guise, then dropped the beat and launched into an epic 5 minute rap against the practice. Who knew he had it in him? You can watch him argue against busting a clot by busting a rhyme on this video, and I’m sure we will see the full fight via the SMACC team in the future. Stress is different to fear. It’s okay to be afraid. Being afraid is about recognising the threat, and that whatever situation you are in is beyond you. Why we’re afraid is not important, recognising that we are afraid is. A special mention goes to the awesome feminEM presentation. It is a call to arms to tackle gender imbalance, to promote the awesome female colleagues we have and to make EM a better place. It’s sad that this is an issue but this can and will be changed. SMACC is awesome for so many reasons. For us the social aspect is beyond measure. Whatever you attend a conference for, SMACC can deliver, but for a chance to connect, reconnect and be inspired, there is no greater forum. Perhaps I (Rich) did not learn as much, or was challenged to learn more as I was at SMACCUS, but we were both left in a more reflective and contemplative state. There are awesome people out there doing awesome things, not just those on stage. If you want to change something then JFDI. Natalie May’s talk on bringing outdoor education indoors. Simon’s talk on Politics and EM. Simon’s talk on Demographics and EM. Simon’s talk on Technology and EM. 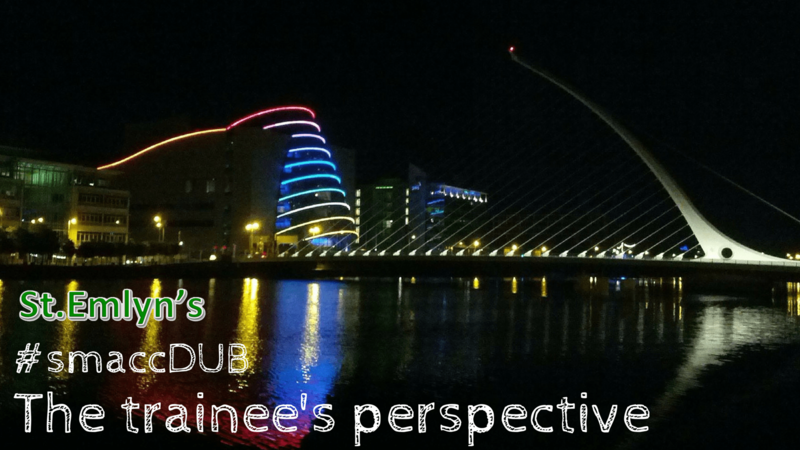 Suzie Edge on another trainee’s perspective on smaccDUB.